The Durahold Magnetic Universal Car Mount securely holds your smartphone to your dashboard or windshield. Ensure surface has been wiped down and cleaned before installing. (Note: Highly recommended to use the adhesive mounting square on uneven or textured dashboards. Install car mount on top of this base for the best hold). 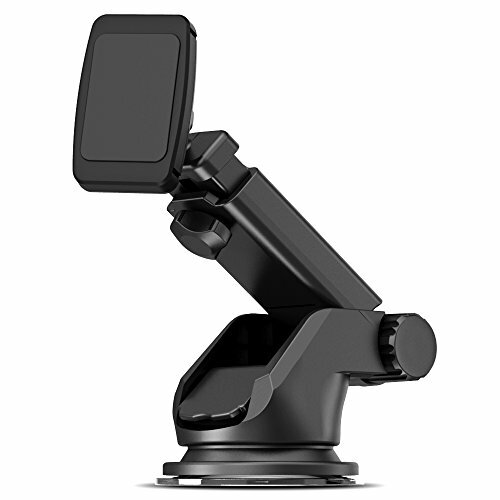 Six powerful magnets built into the mount ensuring your smartphone stays securely on the mounted surface. Metal plates will interfere with wireless charging capabilities. Remove the metal plate before using a wireless charger with phones such as iPhone X, Galaxy S8/S8 Plus, and more. Featuring a ball swivel for easy rotation and jointed arm for easy movement. Highly-flexible rotation provides infinite viewing angles. Position your phone at the perfect angle to enjoy. Equipped with a suction-cup gel pad that provides strong suction and leaves no residue behind. The ultra-strong suction cup can be reconditioned back to its original form by rinsing the suction down with warm water and allowing it to air dry. Limited One Year Warranty from Maxboost ensures maximum protection for your Durahold Magnetic Universal Car Mount. 1) Clean surface before installing car mount. 2) For the best hold, install car mount on top of Adhesive Mounting Square (included). 3) Metal plates will interfere with wireless charging capabilities. Remove the metal plate before using a wireless charger. 4) Thicker phone cases may interfere with magnetic adhesion. 5) Place the magnet metal plate in your case between the cover and the phone. Or stick on the round magnet metal on your phone or GPS.